Today’s global whining comes from NPR with an article titled ‘Climate Groups Retool Argument for Global Warming‘ which reads to me like my title “Climate ‘tools’ to ‘retool. '” The ‘warmists’ just can’t get over the fact that although they’ve been trying to propagate the global warming fraud for years, many of the people who once believed in the Goracle and the dogma of anthropogenic global warming are fast finding out that the only hot air around these days is emanating from places such as the UN, the IPCC, GISS, and Concun, aided by a lap dog media who seem to have never heard a global warming story, no matter how ridiculous, that they didn’t like. There’s problem number one, they claim ‘the evidence for warming is clear.’ ‘Clear’ perhaps to the mentally deficients who believe in their prognostications, but when one looks at the preponderance of evidence, most people with at least 1/2 of a brain will find that anthropogenic global warming is a scam. A scam that’s been aided and abetted by some ‘scientists’ who seem eager for grant money to stay on the global warming gravy train and by some communistic politicians eager to use global warming as a ‘tool’ to redistribute the world’s wealth and achieve that one world global government they lust for. It’s all about control and money, not global warming. Problem 2 is the statement that ‘they’re scratching their heads’ about it. That is enough to make me wonder about how smart these people actually are. It’s like they’ve been hit smack between the eyes with a 2 x 4 and yet they’re clueless about why much of the general public and a lot of science doesn’t buy into their global warming fantasy. In spite of what appears to be a lack of brains and honesty, they somehow feel qualified to tell a whole planet full of people what to believe in. Amazing indeed! To reiterate, it’s not about the science, as evidence read the next quote from Dan Lashof, director of the Climate Center at the Natural Resources Defense Council. See what I’m talking about? It’s not about their faux science or faux debates, it’s certainly not about the truth, it’s about a ‘strategic error!’ It’s about presentation, not science. It’s like going out to dinner. Do you want to eat at nice restaurant that has a bone china plate with a nice looking presentation of your pork chops and vegetables? Or, for the same price, would you rather eat at some greasy diner and have it all dumped in one giant lump of crap on a paper plate? Do you want to hear cries about the world heating up and causing floods, pestilence and starvation? Or, would you buy into the con easier if they put a little ‘presentation’ on it so it’s more appealing and goes down easier? They now appear to be planning another feeble attempt to scam us! 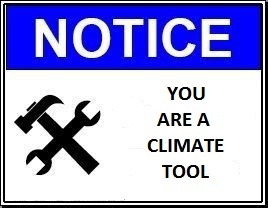 Like good little ‘Climate Nazis, they’ll try and keep the propaganda machine going until the lie becomes the truth. Yes, one year after ‘Climategate’ it appears the ‘warmers’ have finally come to the realization that they screwed up. They didn’t lie hard enough, big enough, or fast enough and they now have the temerity to whine about it. Did they actually think their propaganda of ‘the science is settled’ would actually get everyone on the planet on board with their scheme? Are they that dense? I think in many cases the answer is yes. Yes, because no science is ever ‘settled,’ as it always changes. Someone’s always finding out something new and anyone who believes any science is ‘settled’ is a bonehead in my opinion and it appears there’s no shortage of global warming boneheads running about. One excellent and recent example of why science isn’t ‘settled’ is the ‘alien’ life form just discovered at Mono Lake, California. This ‘alien’ life form just blew everyone in science’s mind because it uses arsenic instead of phosphorous to form its’ DNA. Something science has never seen before on this planet and certain proof that science is never ‘settled.’ Many scientists were probably convinced that every life form on the planet used the standard six elements (carbon, hydrogen, nitrogen, oxygen, sulfur and phosphorus) as the building blocks of life, yet here comes this little microscopic bacteria that changes the whole game. Proof positive that the only ‘settled’ thing about science is that it’s not ‘settled’ regardless of what area of science you want to talk about. Space is another good example of a place where the science isn’t ‘settled’ as evidenced by the frequency of new discoveries of new galaxies and planets, new theories about things like dark matter. We now have three times the number of stars that were previously thought to be floating around the space-time continuum. Our universe may even be inside another universe now. Nothing ‘settled’ there at all. I’m not going to go into the details about all the BS that’s been busted about anthropogenic global warming in this post. You can find plenty of things to make you skeptical about anthropogenic global warming on my site and plenty of others. That’s not the topic here and you can peruse things at your leisure if you’re interested. The topic is that these people are still dangerous as they’ve discovered their scam isn’t working and now realize they need to change their tactics to ensure they keep the scam going. They’re up for finding new ways to proselytize about global warming. It sounds like they might plan to do things on a smaller scale now and stay under the radar. They may be sneaker from now on based on what we don’t know won’t allow countermeasures. Things won’t be done on a global, continental or even on a country level, they’ll now go local to try to get their brainwashing to work. Little nefarious steps may be the new modus operandi. They’ll probably continue to promote anything and everything as being evidence of global warming or being caused by global warming, regardless if it’s true or not. You may not read about it as much in the New York Times or on CNN, but they’ll be scurrying about in your local schools brainwashing the kiddies and at the senior centers, giving seminars designed to get the oldsters to vote yes on everything green and write letters to their elected representatives wanting to know why their pacemaker’s aren’t solar-powered. You’ll see local newspapers publishing little articles designed to brainwash you into believing that bird-choppers (wind turbines) are the way to go along with the occasional item proclaiming that the South Pole will soon be the new Miami and that California’s beach front property will soon be adjacent to the Sierra-Nevada mountain range and not Malibu. Many of the local newspapers will probably publish this tripe because like the big papers, it seems to me that many of them don’t care about the truth anymore because they too, are having financial problems and will eagerly publish just about any headline they think will increase their sales. Fortunately, there are those of us who don’t buy into the anthropogenic global warming scam and will do whatever we can to let the sun shine on the truth. This is the way it’s always been. Remember, the science is never ‘settled’ no matter who issues the proclamation. Was the science settled when it was thought that the Earth was the center of the universe? Was it settled when ‘science’ thought the sun revolved around the Earth? Was it settled when the Earth was found to be round and not flat? Look at the past 100 years and tell me that the science was ‘settled’ when the atomic bomb was made, when nuclear power plants were invented, when the internet was invented, or cell phones, or space ships, or when man went to the Moon. Contrary to what the ‘warmer’s want you to believe, science is never ‘settled.’ Atoms were the smallest building blocks of everything at one time, now it’s nanotechnology. Perhaps sometime in the future science will discover something on an even smaller scale than that. Things change, they always do and always will. Remember all of this the next time you read something about global warming that say’s ‘the science is settled’ because it isn’t. I find it rather amusing that no matter where I read about science or what type of science I read about, I never seem to find anyone saying that any particular science is ‘settled.’ New discoveries abound on what appears to be a daily basis regardless if it’s about space, new medicine, new chemicals, undiscovered dinosaurs or anything else you care to name. The word ‘settled’ seems to only ‘conveniently’ apply to anthropogenic global warming, global warming, climate change, climate disruption, or whatever name you choose to call it and never anything else. Nothing about science is ‘settled’…………….ever. If the ‘tools’ ‘retool’ the message, it doesn’t make it any truer. It’s CO2 Insanity to think otherwise.